Posted July 30th, 2018 & filed under 2018, News . 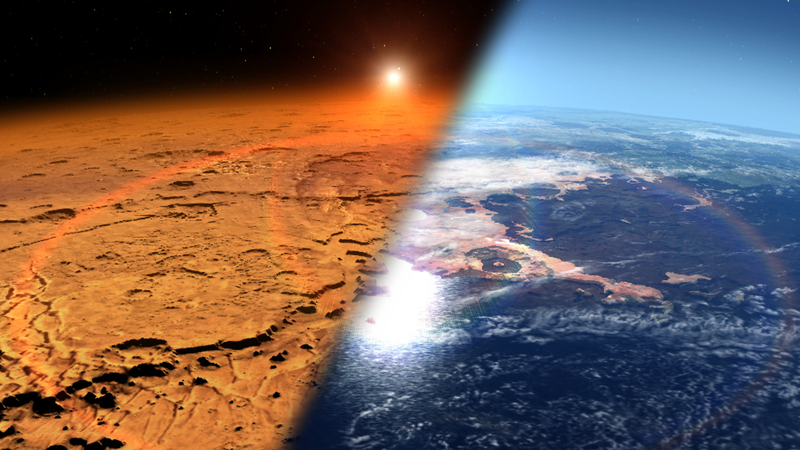 However, Mars does not retain enough carbon dioxide that could practically be put back into the atmosphere to warm Mars, according to a NASA-sponsored study led by LASP Associate Director for Science Bruce Jakosky. Transforming the inhospitable Martian environment into a place astronauts could explore without life support is not possible without technology well beyond today’s capabilities. Posted December 13th, 2017 & filed under 2017, News . How long might a rocky, Mars-like planet be habitable if it were orbiting a red dwarf star? It’s a complex question but one that NASA’s Mars Atmosphere and Volatile Evolution mission can help answer. At the fall meeting of the American Geophysical Union on Dec. 13, 2017, in New Orleans, Louisiana, Brain, also a professor in the CU Boulder astrophysical and planetary sciences department, described how insights from the LASP-led MAVEN mission could be applied to the habitability of rocky planets orbiting other stars. Posted January 30th, 2017 & filed under 2017, News . LASP researchers have discovered an atmospheric escape route for hydrogen on Mars, a mechanism that may have played a significant role in the planet’s loss of liquid water. The findings describe a process in which water molecules rise to the middle layers of the planet’s atmosphere during warmer seasons of the year and then break apart, triggering a large increase in the rate of hydrogen escape from the atmosphere to space in a span of just weeks. Posted October 3rd, 2016 & filed under 2016, News . Today, the LASP-led MAVEN mission has completed one Mars year of science observations. One Mars year is just under two Earth years. The Mars Atmosphere and Volatile Evolution (MAVEN) spacecraft launched on Nov. 18, 2013, and went into orbit around Mars on Sept. 21, 2014. During its time at Mars, MAVEN has answered many questions about the Red Planet. Posted November 6th, 2015 & filed under 2015, News . Posted August 7th, 2015 & filed under 2015, News . Posted July 29th, 2015 & filed under 2015, News . In recognition of his accomplishments and exceptional scientific contributions, LASP research associate W.K. (Bill) Peterson has been elected as a fellow of the American Geophysical Union (AGU). Peterson is being recognized by his peers in the scientific community for his outstanding work in Earth and space sciences with an honor that is bestowed upon no more than 0.1% of the AGU membership annually. Posted November 7th, 2014 & filed under 2014, News . Two NASA and one European spacecraft, including NASA’s MAVEN mission—led by LASP—have gathered new information about the basic properties of a wayward comet that buzzed by Mars Oct. 19, directly detecting its effects on the Martian atmosphere. Data from observations carried out by MAVEN, NASA’s Mars Reconnaissance Orbiter (MRO) and the European Space Agency’s Mars Express spacecraft revealed that debris from the comet, known officially as Comet C/2013 A1 Siding Spring, caused an intense meteor shower and added a new layer of ions, or charged particles, to the ionosphere. The ionosphere is an electrically charged region in the atmosphere that reaches from about 75 miles (120 kilometers) to several hundred miles above the Martian surface. Using the observations, scientists were able to make a direct connection between the input of debris from the meteor shower to the subsequent formation of the transient layer of ions—the first time such an event has been observed on any planet, including Earth, said the MAVEN research team. Posted October 10th, 2014 & filed under 2014, News . NASA will host a news teleconference at 2 p.m. EDT Tuesday, Oct. 14, to announce early science results from the LASP-led Mars Atmosphere and Volatile Evolution (MAVEN) mission. Launched in November 2013, the spacecraft entered orbit around Mars on Sept. 21 completing an interplanetary journey of 10 months and 442 million miles (711 million kilometers). MAVEN is the first spacecraft devoted to exploring and understanding the Martian upper atmosphere to help scientists understand climate change over the Red Planet’s history. Posted October 7th, 2014 & filed under 2014, News . NASA has awarded a team led by the University of Colorado Boulder, which includes LASP scientists, more than $7 million to study aspects of the origins, evolution, distribution and future of life in the universe. Posted September 24th, 2014 & filed under 2014, News . The LASP-led Mars Atmosphere and Volatile Evolution (MAVEN) spacecraft has obtained its first observations of the extended upper atmosphere surrounding Mars. The Imaging Ultraviolet Spectrograph (IUVS) instrument obtained these false-color images eight hours after the successful completion of Mars orbit insertion by the spacecraft at 10:24 p.m. EDT Sunday, Sept. 21 after a 10-month journey. Posted February 4th, 2014 & filed under 2014, News . The MAVEN spacecraft and all of its science instruments have completed their initial checkout, and all of them are working as expected. This means that MAVEN is on track to carry out its full science mission as originally planned. The mission is designed to explore Mars’ upper atmosphere. It will determine the role that escape of gas from the atmosphere to space has played in changing the climate throughout the planet’s history. MAVEN was launched on November 18, 2013, and will go into orbit around Mars on the evening of Sept. 21, 2014 (10 p.m. EDT). After a 5-week commissioning phase in orbit, during which it will get into its science-mapping orbit, deploy its booms, and do a final checkout of the science instruments, it will carry out a one-Earth-year mission. It will observe the structure and composition of the upper atmosphere, determine the rate of escape of gas to space today and the processes controlling it, and make measurements that will allow it to determine the total amount of gas lost to space over time. Posted December 23rd, 2013 & filed under 2013, News . Posted November 19th, 2013 & filed under 2013, News . A LASP-led mission that will investigate how Mars lost its atmosphere and abundant liquid water launched into space on November 18 at 11:28 a.m. MST from Cape Canaveral Air Force Station in Florida. The Mars Atmosphere and Volatile Evolution (MAVEN) spacecraft separated from an Atlas V Centaur rocket’s second stage 53 minutes after launch. The solar arrays deployed approximately one hour after launch and currently power the spacecraft. MAVEN now is embarking on a 10-month interplanetary cruise before arriving at Mars next September. Posted November 14th, 2013 & filed under 2013, News . MAVEN is set to launch aboard a United Launch Alliance Atlas V 401 rocket Nov. 18. The two-hour launch window extends from 1:28 to 3:28 p.m. EST. Liftoff will occur from Cape Canaveral Air Force Station’s Space Launch Complex 41. Launch commentary coverage, as well as prelaunch media briefings, will be carried live on NASA Television and the agency’s website. The following is a list of MAVEN launch-related briefings, events, and activities. Posted August 8th, 2013 & filed under 2013, News . Haiku recognized in the LASP-led MAVEN message-to-Mars contest were announced today on the Going to Mars campaign website. Haiku authors from around the world—including Palestine, India, Australia, and Europe—entered the contest. The top five winners—all those whose haiku received 1,000 votes or more—include popular British blogger Benedict Smith and well-known American poet Vanna Bonta. Other entries receiving special recognition include MAVEN team selections in categories ranging from haiku specifically about MAVEN to humorous haiku. Posted July 14th, 2013 & filed under 2013, News . Posted May 20th, 2013 & filed under 2013, News . The winner of the LASP-run MAVEN student art contest turns out be the work of more than a single young person. The First Place entry, selected by online public vote, was the work of a Colorado-based Kindergarten Enrichment class. Posted May 1st, 2013 & filed under 2013, News . The MAVEN mission is inviting people from all over the world to submit their names and a unique message online. Participants’ names and the top-voted messages will be burned to a specially-designed DVD and sent to the Red Planet aboard the MAVEN spacecraft, scheduled to launch in November, 2013. Posted March 14th, 2013 & filed under 2013, News . Members of the worldwide public are invited to participate in NASA’s Mars Atmosphere and Volatile EvolutioN (MAVEN) mission through a new Education & Public Outreach (E/PO) effort called the Going to Mars campaign. MAVEN, which is the first mission devoted to understanding the Martian upper atmosphere, has a robust E/PO program designed to engage a variety of audiences in the mission. Posted January 23rd, 2012 & filed under 2012, News . In recognition of their accomplishments and exceptional scientific contributions, two LASP scientists have been elected as fellows of the American Geophysical Union (AGU). Bruce Jakosky and Cora Randall have been recognized by their peers for their outstanding work in Earth and space sciences with an honor that is bestowed upon not more than 0.1% of the AGU membership annually. Posted November 1st, 2011 & filed under 2011, News . Posted July 22nd, 2011 & filed under 2011, News . Posted October 25th, 2010 & filed under 2010, News . Posted October 5th, 2010 & filed under 2010, News . Posted June 17th, 2010 & filed under 2010, News . Posted June 18th, 2009 & filed under 2009, News . Posted September 15th, 2008 & filed under 2008, News . Posted January 8th, 2007 & filed under 2007, News .